With all oceanview accommodations for just 112 passengers, the SeaDream II is small enough to provide an intimate atmosphere but boasts a wide range of amenities, including Balinese DreamBeds topside and a water-sports marina extended from the stern, giving guests a base for kayaking, water skiing or sailing. Should you be in the mood to practice your golf, you may do just that on SeaDream’s Golf Simulator. Select from over 30 world renowned golf courses and enjoy them in air conditioned comfort. Equipped with his and hers clubs, a seating area and in lieu of a caddy, a bartender from the Top of the Yacht Bar is available to ensure you remain hydrated. The SeaDream Spa and Fitness Centre has massage therapists from Thailand with a personal trainer on staff offering tai chi, yoga and aerobics classes upon request. Whether guests dine in the elegant Main Dining Salon or in the sea breeze at the Topside Restaurant, they will enjoy gourmet cuisine and outstanding service. The luxurious touches extend to the all-suite staterooms, thoughtfully appointed. The Owner’s Suite is 447 sq. ft and includes a separate master bedroom with a permanent queen size bed and flat screen TV. A large master bathroom with massage show and a separate bath having views of the sea. This is Suite number 315 on both yachts, located mid ship on Deck 3, close to the Pool. The Admiral’s Suite enjoys 375 sq. ft of living space with ocean views from a total of 3 picture windows. Separate and private en suite master bedroom with permanent queen bed and closet. Marble lined bathroom with multi jet shower and bath. Built in dresser with writing desk. The Admiral Suite is Suite 400 on both yachts and is near the Library. Combine two Yacht Club Staterooms to create a Commodore Suite. These Ocean view suites provide a choice of two twin beds or a queen size bed, two full marble lined baths with multi jet showers, a seating area with sofa, chair and cocktail table, 2 spacious closets and built in dressers with writing desk. There are 8 possible Commodore Suites and they average 390 sq. ft.
Yacht Club Staterooms average 195 sq. ft. These ocean view staterooms have a picture window. Choice of 2 twin beds or 1 queen bed. Marbled lined bath with multi jet shower and a well appointed open living area with sofa, chair and cocktail table. It also has a built in dresser with writing desk. 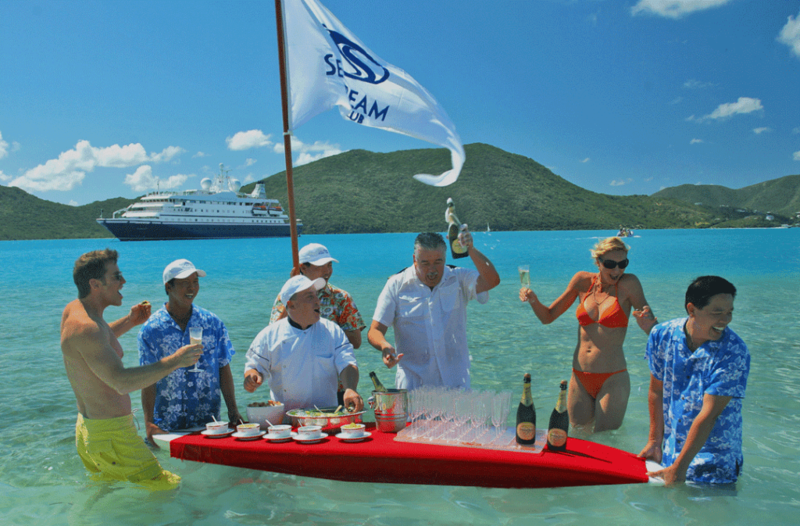 SeaDream II’s itineraries include Caribbean, Cuba, and the Mediterranean. The ship was completely redesigned and refitted in 2002, with a further refurbishment in 2007.